Queensland Transport and Logistics Council Chairman Neil Findlay welcomed in new Chief Executive Officer Renata Berglas this week. Renata brings with her a wealth of skills in industry engagement, issue identification and navigating government to achieve results. Her previous roles in the Department of Agriculture and Fisheries and AgForce Queensland provide a strong base in policy development and application. Efficient integration and linkage of freight and logistics systems across the whole supply chain. As Queensland seeks to increase economic competitiveness in the global marketplace, it is critical we have a freight system that supports resilient, effective and efficient supply chains, and which can meet the current and future demands. To that end, the QTLC has undertaken an analysis of the global supply chain characteristics and policy imperatives driving economic development and growth, to understand how these relate to proposed and existing infrastructure. In summary, QTLC’s objective is to Better understand supply chains in Queensland, the drivers of change, and the policy and infrastructure requirements to support future growth. 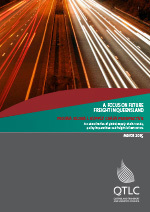 Future Freight in Queensland from a Global Supply Chain Perspective (this report) – This examines the major Queensland supply chains, global supply chain trends, policy imperatives and freight infrastructure. Eleven of Queensland’s major supply chains are detailed through Supply Chain Perspectives, with this information informing subsequent investigations. 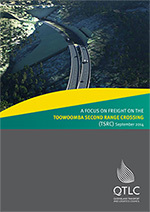 The Toowoomba Second Range Crossing (TSRC) – Using information derived from the Supply Chain Perspectives and an Industry Forum, this report provides an examination of the supply chain benefits, freight efficiency opportunities and broader economic opportunities provided by the TSRC. 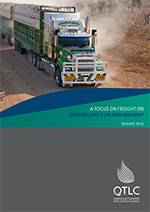 Queensland’s Inland Highway – This report identifies a resilient inland freight route connecting South East Queensland to northern Australia and to the key nodal infrastructure that supports Queensland’s major supply chains.